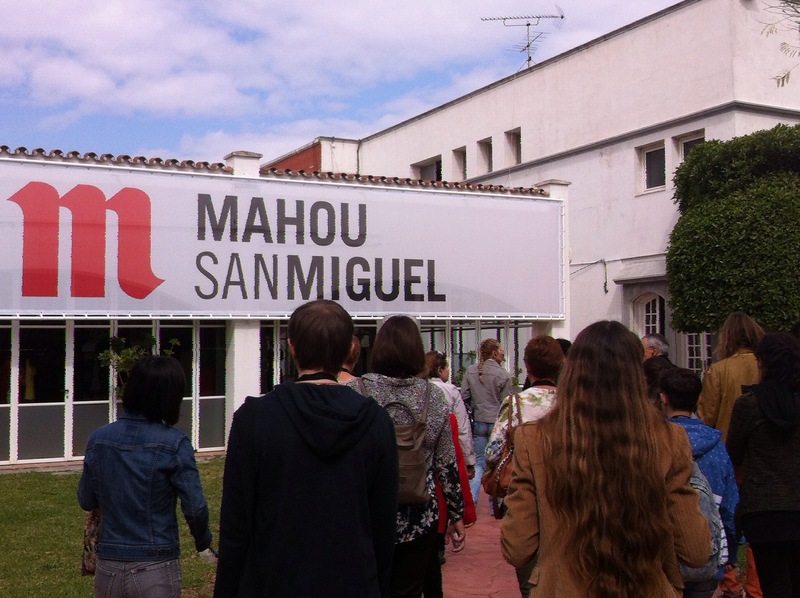 The course I’m on at Málaga’s Escuela Oficial de Idiomas is heavily subsidised by the Spanish government (thanks guys!). So when the head of Spanish said we were going on a “school trip” we didn’t expect a great deal, to be honest. Imagine our delight, then, when it turned out to involve free beer and bocadillos! 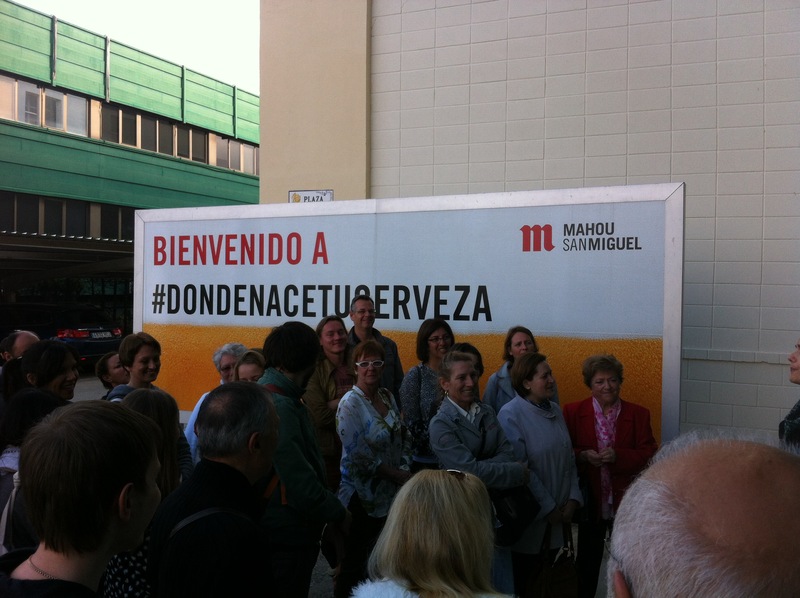 Everyone who has ever flown in or out of Málaga airport has seen the outside of the San Miguel brewery, that huge sign, and probably the endless stacks of barrels and crates of beer bottles. Inside the complex it is pretty mind-blowing. Impressively modern inside, it relies on the most advanced technology available. This has its downside, of course, which is that the vast workforce of years gone by has been shaved down to the minimum. 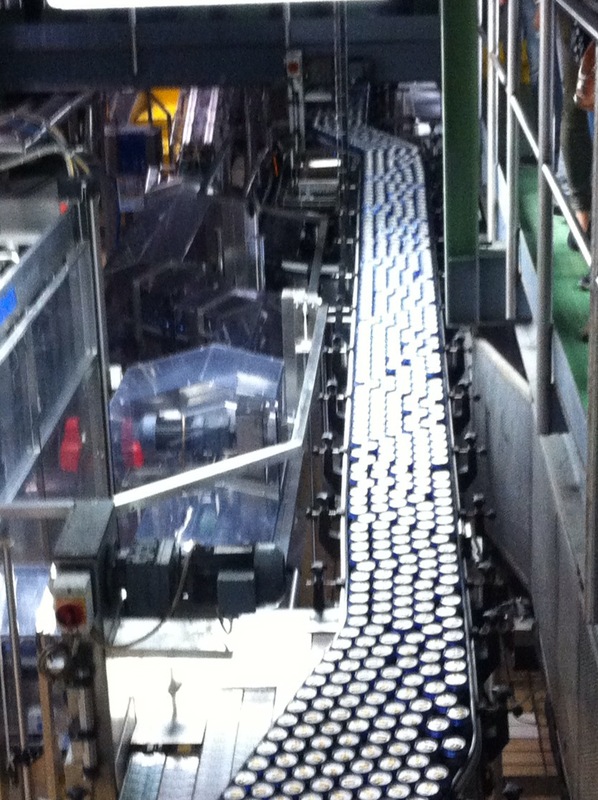 Each massive “line”, for cans, bottles, barrels etc, is operated by just six people and a dozen computers. This is the line that fills 15,000 cans of San Miguel per hour. If filled in one go, it would be horrendously gassy and would explode, so every can goes round a filling loop, getting just a squirt from each hose, needing to pass 15 hoses to fill it. I remember in the early 1980s when I worked in touring theatre, we used to go to the Theatre Royal in Bury St Edmunds. My digs were in the same street as the Greene King Brewery, and on Mondays and Tuesdays the whole town smelled of yeast and hops. We were taken on a tour once, and I can still remember the smell, the huge vats, the paddles which stirred the mash manually (the second year we went, they had mechanised the stirring!) and the chap whose job was quality-assurance, which obviously meant tasting each batch. He said his tongue was invaluable, though he hadn’t gone so far as to insure it for a million pounds, like the Tetley’s Tea-taster or the Costa Coffee-taster have in modern times. At San Miguel the quality control, sadly, is done by computer. Every empty bottle is “viewed” by a computer as it whizzes by on the conveyor belt, checked for flaws or dirt, and plucked out of the line if it falls below standard. After filling, too, another computer “views” each bottle and can analyse the content, rejecting anything imperfect. A white-coated technician wanders casually between two computers, watching those rather than the thundering filling-lines and the thousands of bottles, cans or barrels flying by and then stacking themselves neatly on pallets which roll automatically out into the storage area. The Málaga site alone produces 2 million HL, which was a unit of measurement I had to look up – it means HectoLitres, which are 100 litres each. 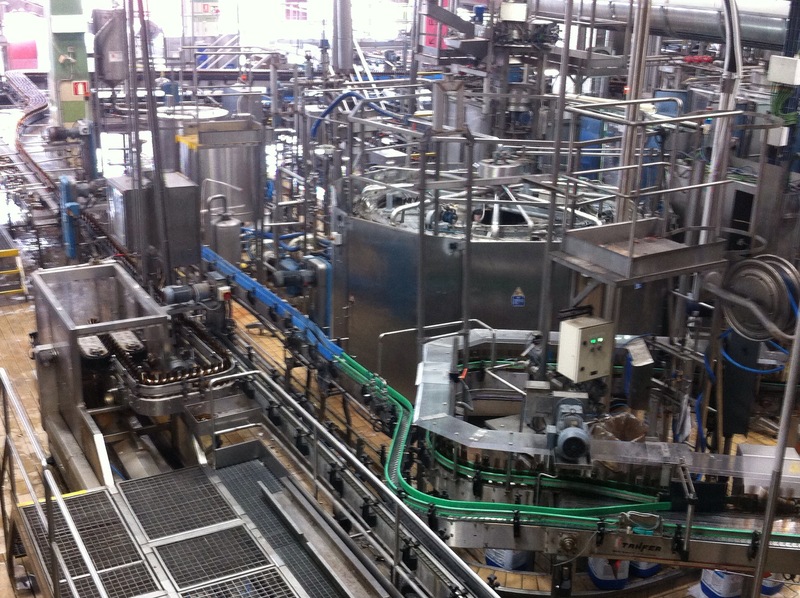 So 200 million litres a year, which is a lot of beer in anyone’s book (or glass). The tour, throughout which we wore protective glasses and a headset through which we could hear the guide / PR lady, was intended to impress, and it did. Afterwards we crossed the pretty little park into the Visitors’ Centre for savoury filled croissants, local cheese drizzled with olive oil, and of course the beer-tasting. San Miguel also make Alhambra and Mahou, so there was a flavour for everyone. 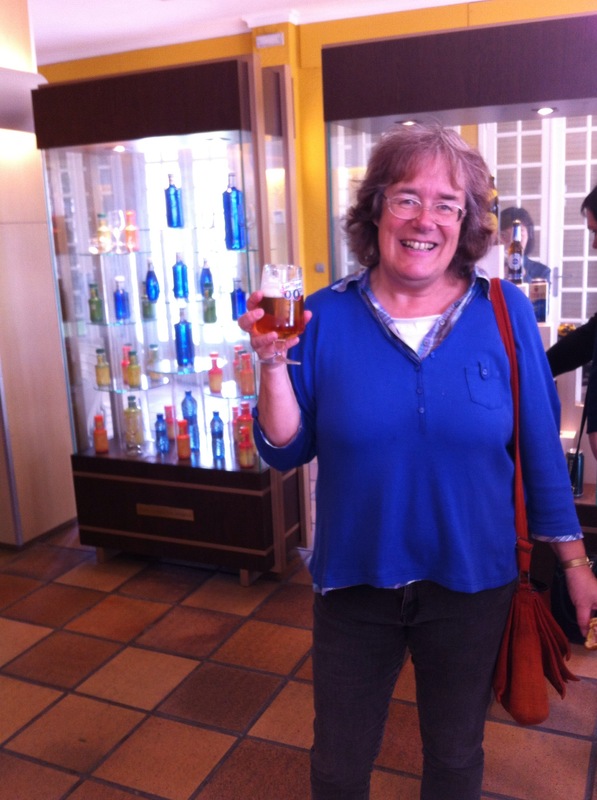 Even me – a life-long teetotal, I have never even tasted alcohol-free beer! So this was a first, and I chose the San Miguel Zero flavoured with apple juice. Delicious! Sadly it is only available in cans and sold via supermarkets, and therefore is not served in bars. Group visits can be organised through the brewery website. As far as I know, individuals need to find an organisation to go with (many villages, clubs or language schools organise trips like this). Our group staggered back to the Escuela Oficial de Idiomas trying to remember the new vocabulary we had learned, and raising a toast to the Spanish government for probably the best “school trip” I’ve ever been on! 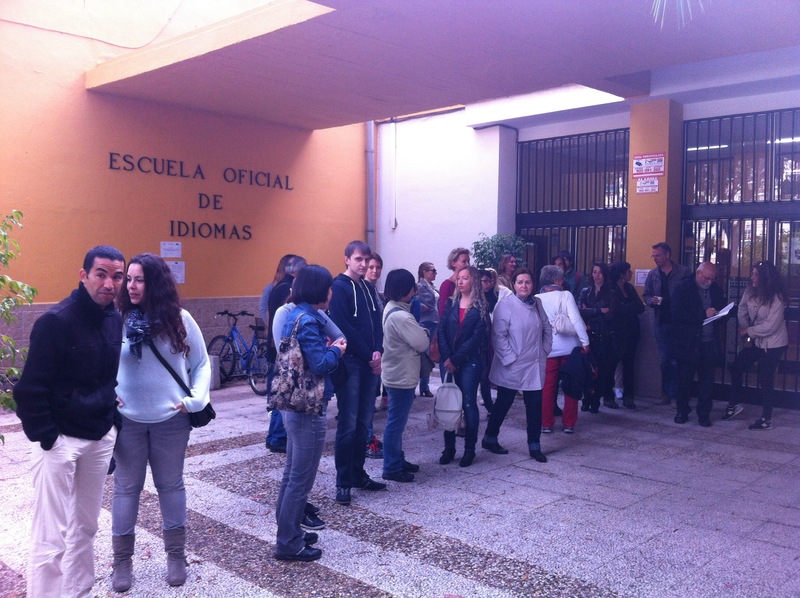 This entry was posted in Spain and tagged Andalucia, Escuela Oficial de Idiomas, learning Spanish, Málaga, San Miguel, Spain by tamaraessex. Bookmark the permalink. Where do their hops come from?